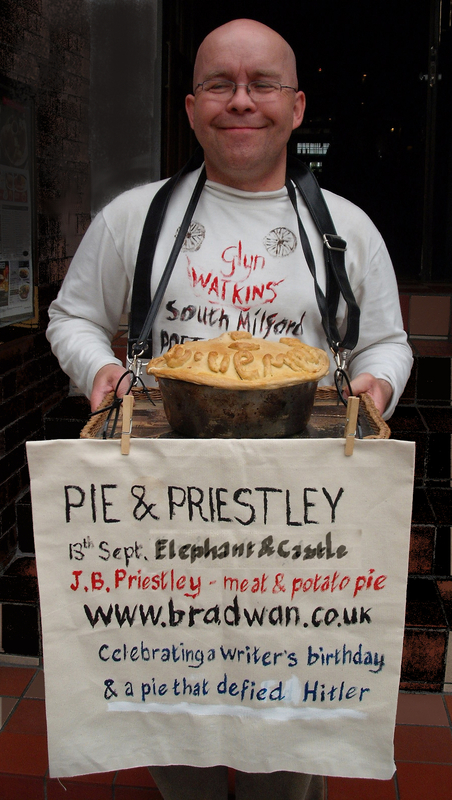 Tickets for both Pie & Priestley and Curry & Kipling are available from the Elephant and Castle, Lewes, East Sussex. 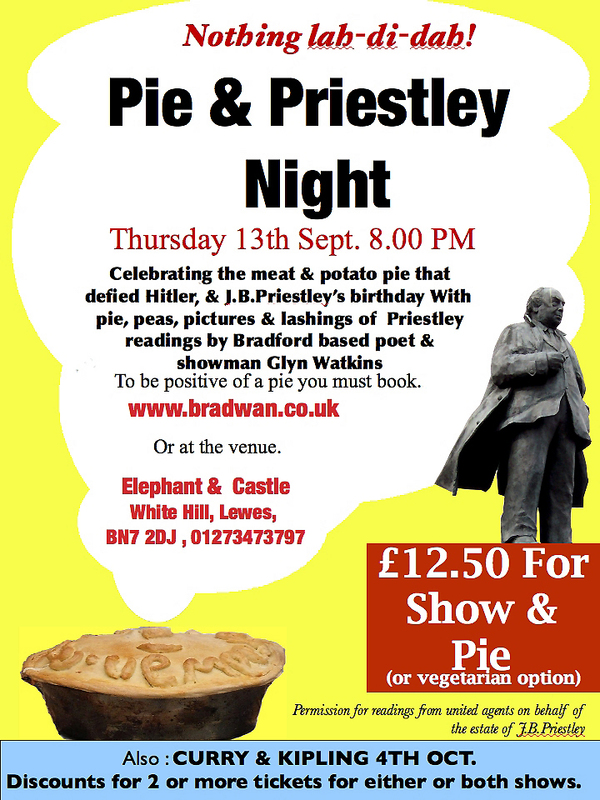 (Celebrating a Meat & Potato Pie That Defied Hitler and J.B.Priestley’s birthday. An event with projected images featuring readings and performances from the work of J.B.Priestley, by Bradford based poet and showman Glyn Watkins. Includes a meat & potato pie (or veggie option) and pea supper. 8.00 pm. Thursday 13th Sept.
Tickets £12.50, inc. supper. 2 tickets just £20. Discount for multiple bookings for this show and Glyn’s Curry & Kipling show at the same venue 4th Oct. Tickets available from venue from 20th Aug. or from http://www.bradwan.co.uk soon after. J.B.Priestley wrote many books and plays, including When We Are Married; An Inspector Calls and The Good Companions, but his finest hour was probably as a broadcaster during the worst year of World War Two, when his Sunday evening Postscript talks on the BBC gave hope and courage to millions. One of the best remembered broadcasts was about a Bradford meat and potato pie shop with a huge, steaming meat and potato pie in the window; a pie that survived the Blitz. Glyn Watkins is the creator of Pie & Priestley and Curry & Kipling Night’s; the UK Hat Throwing Championship; The Little Britton Festival (celebrating the musical coalman of Clerkenwell Green); as well as being the South Milford Poet of Fete and the Bard of the Red Beard at national red headed festivals. Ma had a grand 91st birthday. We finished a bottle of champagne in the morning with help from neighbours; me and Basil went for pizza; we watched racing; cracked another bottle of sparkling; I made supper; one of her favourite carers came to put her to bed; and most importantly she had no reactions from yesterday’s excursion and excitement. A really nice day. Linda, friend and cleaner to my mother, took the family to Brookwood for my father’s grave stone blessing and so ma could get communion. This was her birthday treat and she enjoyed it all. The service lasted less than 90 minutes so was a short one. Did the long commute south today. Exchanged just one word with another passenger the whole way! Managed to plant out some foxglove seedlings in the morning (probably too soon but just a single day of full sun can dry the seed tray and all the seedlings out) and cut the most overgrown part of ma’s back lawn in the evening (the hover mower I bought her years ago has metal blades, which were needed); on between I saw about half the wheat fields I passed had been harvested, and saw light sign of weather flattening in the uncut reaped fields, which is a hopeful sign for a good harvest, and that would be a blessing to set against present woes. Since getting the exhibition up and going, and cutting grass and brambles for money, I had a bit of an ill in bed, Gladstone, holiday. My brother would tut at this point and pronounce that the sneezing was just post stress reaction; ex’s might blame the alcohol; and I would offer cats and dust; but whatever the cause the result was I managed to re-read J.B.Priestley’s The Good Companions in 42 hours; and enjoyed it more than any previous reading. You never think it is clever while you are reading it, but if you stop (as I was doing all the time) to think about how and what he was writing it is very, very clever; and groundbreaking for its time. The thing is that it was a sales phenomena, so any deep criticism that discussed its cleverness was left behind. I met Bev today to show her my exhibition, and we then had dinner at Mamma Mia’s, Bradford. Good food and not over facing portions. It is a toss up between it and Orlando’s for me. You get more at Orlando’s, but if I get 2 courses from their early bird special I cannot eat all my spaghetti; so as I write this I am thinking that while Mamma Mia’s spaghetti bolognese was better; Orlando’s was good, and there was more of it, so I would not need a second course, which would save me money. Orlando’s is further for me to travel though. Me and Bev seemed to have settled how to split up and still be mates; which pleases us both: but especially me, seeing she now pays me to do her garden and loft! I just need a few more thinking I am worth an effort, and who manage to get close, but who then tire of my snoring, grunting, and constant talking, especially when watching a favourite tv show; but who still needs the garden doing. Just a few more and I can stay off the dole! Brought tears to my eyes. Powerful film, which finished with ‘Waterloo Sunset’ which brought the tears. I loved it even before singing as I walked from New Cross Gate (where I woke up to find the lass I was with shagging my best mate in front of the Gas Miser) to Victoria, with a pause to wonder about throwing myself in ‘the dirty old river, from Charring Cross Bridge. All this between midnight and dawn. It’s been a fair two days. No more sales today; sitting in the Sparrow was just drinking with mates. On the other hand I earned money cutting grass and have a free, self catering, night away from home. I also rescued the hard drive from my 12 year old iMac, and got it working. I wanted to do that last week, so I could print some of the images from the original file rather than hving to scan, but the part I need did not come soon enough. Better really. The exhibits are fine, and the I did not need bigger pictures than I had; but I can now do them. According to several people who talked to me today about my exhibition Lines of Pleasure Lines of Power – The art, poetry & sculpture of pylons (at the Sparrow Beer Cafe) it is Outsider Art. The fact they said it with capital letters suggests I am already too late to help start the bandwagon, and thus get a cushy title with benefits in the modern art bureaucracy; but it is still nice to know that what I do has now got an editorial pigeonhole. I just have to remember it the next time I write a pr for something I do. Hammering – Hanging – Cutting – Screwing – Sticking – & Swearing.